Your choice of topping – hazelnuts, sesame seeds, poppy seeds, etc. Step 1: Preheat the oven to 180°C/Gas Mark 4. Step 2: Mix the egg yolks and salt together, then brush the puff pastry sheets. yolk side facing downwards). There should be approximately a 1cm gap between the layers. Step 4: Egg wash the top of the puff pastry and sprinkle with your choice of topping. Cut into strips 1cm in width. Taking either end of the ‘straw’, twist it and lay onto a baking tray lined with baking parchment or a silicone baking sheet. Repeat until all straws have been twisted. Step 5: Place in the oven and bake for 15 mins or until golden and crisp. Leave to cool before serving. 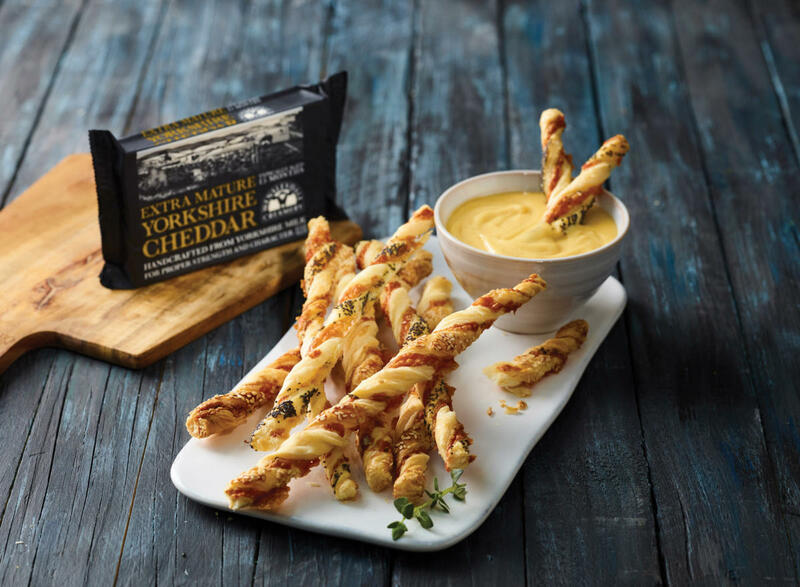 Chef’s Tip: You can prepare the Cheese Straws in advance and store in an airtight container for approximately 2 days. Step 1: In a pan, mix all the spices and bay leaf into the cream and heat. Stir as it heats. Step 2: Gradually stir in the Yorkshire Cheddar. Once all melted remove from the heat and it’s ready for dipping!